Now that we have seen the final new plays of the year, it is time to turn our attention to our 2014 favorites. This was a relatively strong year; where the canker gnaws, as good old blimey slimey Captain Hook might say, is in the musical department. We are hard put to find two specimens for our list; and both are revivals of shows written back before many of us were born. (The good news is that the top musical on last year's list, Jeanine Tesori and Lisa Kron's Fun Home -- which played a limited engagement in 2013 at the Public -- will reach Broadway in April.) But first-rate theatre is first-rate theatre. Even without songs. Here they are, in approximate, though not exact, order of enjoyment. 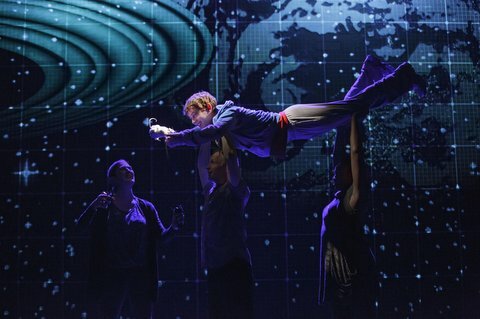 Playwright Simon Stephens and director Marianne Elliott have taken Mark Haddon's 2003 novel and exploded it onto the stage. This production from the National Theatre -- stomping ground of Ms. Elliott's War Horse -- is every bit as exciting as the World War I epic, only moreso. True theatrical brilliance -- from author, director, designers and cast -- awaits at the Barrymore. Not to be missed. Suzan-Lori Parks, a Pulitzer winner for Topdog/Underdog, surpasses herself with the first three of nine one-acts centering on -- well, father returning from the war. (In Parts 1, 2 and 3, that's the American Civil War.) It is too early to tell whether the not-yet-completed trilogy will be a monumental dramatic milestone on a level with, say, Angels in America. Thus far, though, Parks is on track for something brilliant. Anthony Giardina's political comedy, from the folks at Lincoln Center Theater, was an intelligent, provocative, incisive drama about politics, people, ideals and principles. 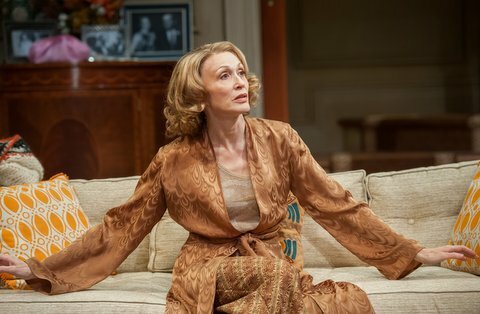 The dialogue was razor-sharp, the direction of Doug Hughes was impeccable, and Jan Maxwell delivered an altogether superb performance. The best thing of its kind since LCT's Six Degrees of Separation, Giardina's comedy belongs on Broadway in 2015. The 1944 Leonard Bernstein/Betty Comden/Adolph Green musical comedy about three WW II gobs on 24-hour shore leave in "New York, New York" looked faded on its two prior Broadway revivals, but the current edition -- directed by John Rando and choreographed by Joshua Bergasse -- honors the material and makes it gleam. A clutch of talented featured players -- led by Tony Yazbeck, Jay Armstrong Johnson, Alysha Umphress and Elizabeth Stanley -- and a tip-top dance corps reveal that On the Town is just fine, thank you, and loaded with entertainment value. 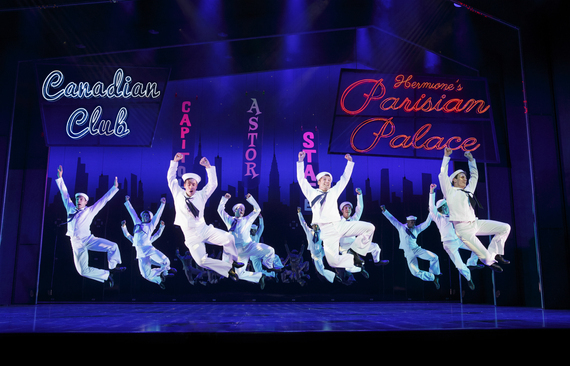 Almost depressing -- amidst of a crop of sorry new Broadway musicals -- was the sparkling presentation of Frank Loesser's 1956 "musical musical" on view for a mere six performances at City Center Encores. Laura Benanti, Shuler Hensley and Cheyenne Jackson played the leads, with director Casey Nicholaw showing us just how good Mr. Loesser was at musical theatre storytelling. This Most Happy Fella was the most happy musical, indeed. 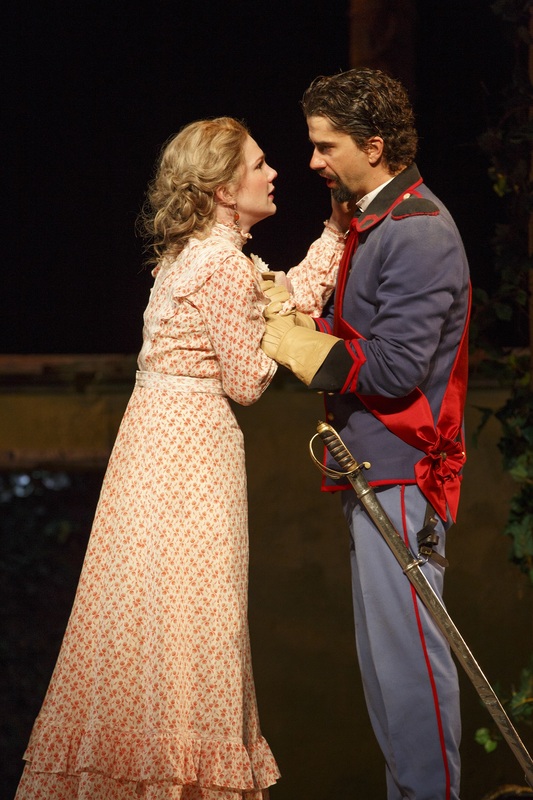 This year's most sparkling evening came at the Delacorte, with Lily Rabe and Hamish Linklater cutting up like a modern-day Katharine Hepburn/Cary Grant duo in Shakespeare's enchanted comedy. Enhanced by inspired performances from Brian Stokes Mitchell and John Glover, the Public Theater and director Jack O'Brien gave us a midsummer night of pure delight. Katori Hall, whose Martin Luther King-themed The Mountaintop didn't exactly impress this viewer when it played the Jacobs in 2011, brought this astonishing play to the Signature Theatre. Hall takes us into a strange and remote place -- an all-girls Catholic school in Rwanda, c. 1981 -- and immerses us in the girls' world, their problems, and their miracle. A moving, important and chilling play, under the firm hand of Michael Greif. Bedlam Theatre has, in two short seasons, become a "don't miss" stop for adventurous theatergoers. Last winter's four-person Saint Joan was a marvelous distillation of Shaw, and this fall's ten-person Sense and Sensibility is a glorious romp which captures the magic of Jane Austen's first novel. What's more, the acting company -- alternating Austen in rep with an intriguing, modernized version of The Seagull -- bring a buoyant joy of performing to their lucky audience. In an unlikely case of theatrical archaeology, the Roundabout found theatrical gold in British director Lyndsey Turner's production of Sophie Treadwell's obscure 1928 play. With an astonishing performance by Rebecca Hall and literally scene-stealing scenery by Es Devlin, Machinal -- based on the 1927 New York trial of convicted murderess Ruth Snyder -- was startling, electrifying, and sizzlingly good. Scenery, lighting, costumes, sound and incidental music all combined to create an altogether stunning theatrical experience. Robert O'Hara's coming-of-age play was rude, raucous, vulgar, hysterical and so honest that it was irresistible (although definitely not for the faint of heart, or morals). The play followed the progress of an autobiographical protagonist through eleven sketches that at first seemed haphazardly laced together; but each scene was funnier than the last, and the result was one of those plays that keep you laughing and thinking. Not your typical subscription theatre fare, and Playwrights Horizons is to be applauded for sticking out its neck (or perhaps I should say its "booty").